I’m a superhero guy. This is a distinct type of the creature “guy”. There are many other types and sometimes you’ll even see hybrids. The others are probably familiar to you: sports guy, car guy, outdoors guy, business guy, music guy, barfly guy, creepy guy, etc. I don’t knock any other type and actually share some minor characteristics with some of the others. Thirteen years ago I gained another type: Dad guy. But I’ve always been a superhero guy at heart. Growing up in Syracuse in the 70’s and 80’s, there was one place to go to for comics: Dream Days. Run by Mike, an aging John Lennon lookalike, Dream Days was the place for comic book lovers. Mike was everything positive that pop culture says about the 60’s: optimistic, community-minded, and welcoming. When my brother Matt was in the hospital for a pretty serious surgical procedure as a young boy, Mike showed up at the hospital with a massive stack of comics for Matt to read while convalescing. I think Mike’s instructions were to read them, enjoy them, bring back what he didn’t want, and get better! Mike seemed to live at the store and the positive experiences talking to him there probably cemented my love of comics. If my brothers and I had been good or particularly well-deserving of a treat we could sometimes convince our parents to take us to Dream Days. (This was not easy for a lower-middle class family with 4 children. I appreciate that more now than I ever could as a kid.) The only downside to a trip to Dream Days was that our parents were willing to spend about a tenth of the time in the store that we wanted. Walking in, you’d quickly peruse the new comics before poking around the back issues, graphic novels, or anything else you could get your hands on. When given the time warning, you’d quickly circle back to the new rack (unless you discovered some gem in the back issue bins for which you’d need to begin bargaining with Mom or Dad). Carefully picking the handful of comics that you were budgeted you’d then watch as Mike rang up the books on an archaic cash register, slide them into a yellow glossy plastic bag (separate bags for each brother- thanks Mike!) then back to the car for the ride home. Never was there a quieter trip with 4 boys than the return leg home after a stop at Dream Days. Although I stopped collecting comics as young adult, I never lost my love of the genre. In recent years I’ve found digital versions of many of my old favorites. I eagerly anticipate the next superhero movie. (Just a few months until The Avengers!) I look forward to dissecting with Matt the triumphs and missteps of the latest adaptations. Still a superhero guy at heart. As the father of three boys- ages 13, 5 and 3 in February 2012- I’ve been thrilled every time one of them showed an interest in anything heroic. The fact that Hollywood has gotten pretty good at telling good comic book stories has helped. It’s just exciting to share something with your boys that you’ve always loved. Arguably, it’s one of the greatest joys of fatherhood for me so far. 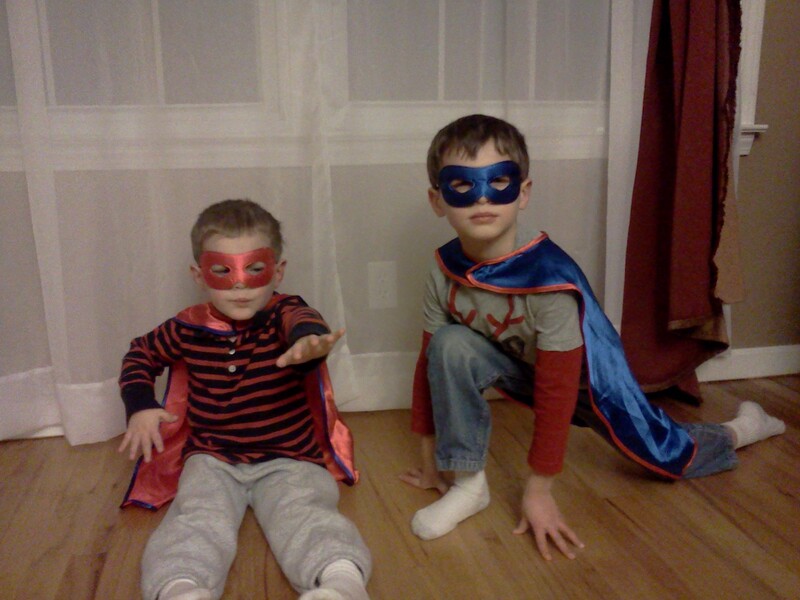 Noodle, the 5 year old, has definitely embraced the superhero motif. Noodle loves Batman, Iron Man, and Captain America. (Clearly he is an intelligent young man with impeccable taste!) It was very quickly after he first got hooked on superheroes- more than a year ago- that my two roles collided. Superhero guy versus Dad guy. If you’re a Dad, this may be familiar to you. If not, and parenthood is in your future, prepare yourself. These two types have slightly different world views. Superhero guy believes in the incredible, the mythical, the things that inspire us to surpass the limitations that we think constrain us. Dad guy is protective, a teacher, concerned with shaping his children to become good adults. These two types are not mortal enemies- like Cap and the Red Skull- but have different priorities. These priorities were in conflict when Noodle decided that he was going to learn to fly. It started simply enough. Drawn into the movies and cartoons, he started mimicking the kicks, punches, and heroic poses of his favorite characters. Flying was just a new aspect of his play. Like any fledgling hero, Noodle started out cautiously. His flight began by launching himself off the ottoman. He had seen enough cartoons and movies to know that, in order to fly forward, he’d have to immediately turn parallel to the ground. So his launches were very immediately followed by belly-flopper style landings on the floor of the den. I credit his persistence because, although he wasn’t seeming to gain much altitude after each initial leap, he continued putting more and more effort into his launches, resulting in harder and harder crashes. Finally, Dad guy’s partner/nemesis- Mom girl- pointed out that Noodle was in danger of hurting himself. The task of putting a stop to the yet-unsuccessful flying lessons was assigned to Dad guy. Ugh. This actually caused some hesitation in me. Dad guy understood that it was important to explain to Noodle that he could not, in fact, fly. He was a little squirt and not really hitting the floor that hard but it was only a matter of time before a landing hurt him. But the last thing that superhero guy wanted to do was to drag Noodle into the mundane world. A dilemma. Really I am Nemesis Mom Girl!!! Your description of Dream Days rings 100% true—I often think about how great it would be to visit that store, circa 1982, one more time. I know what you mean! I ran into Mike about 10 or 12 years ago. I think he was working at one of the area hospitals. He was still the same old Mike- super friendly and happy to chat with an old customer. Nice post! I have fond memories of going to Dream Days every weekend in the early 80s. Great store, especially at the original location on Montgomery Street. I still have all the comics I bought there… quite a few. I also have a daughter who loves superheroes and who accompanied me to the NY Comic-Con last October.